2nd Battalion the Yorkshire Regiment, attached to 2nd Battalion Wiltshire Regiment. Son of S. G. and A. G. Leatham, of Hemsworth Hall, Wakefield; husband of Everil G. Leatham, of 30, Frenchgate, Richmond, Yorks. Queen’s South Africa Medal confirmed on roll WO 100/178 ff 3 & 88, which also records an entitlement to the clasp Orange Free State. Gazetted to the Yorkshire Regiment as Second Lieutenant 11 August 1900, he was the best shot in his party of recruits at Strensall with a score of 450. He joined the 1/Yorkshire Regt at Barberton, Transvaal 8 February 1901, and was posted to B Coy. He was promoted Lieutenant 1 May 1902. While in South Africa he played at full-back for the regimental soccer-team, earning considerable praise for his skill and application. He also indulged in ‘sport’, contributing articles on this subject to the Green Howards Gazette. On its return to England the 1/Yorkshire Regiment was stationed at Sheffield, and Leatham took part with the troops lining the route in Bradford when the Prince of Wales opened the Exhibition there on 4 May 1904. Leatham was presented to the King at a levée at St James’s Palace 7 June the same year. For a time in 1904 he acted as the 1st Battalion correspondent for the Green Howards Gazette. The GHG for September 1904 recorded his passing the final examination for promotion to Captain. He was a member of the winning B Company team in the Green Howards Challenge Cup (shooting) for 1904, and he led K(1) Company (previously B Company) to 11th place in the Evelyn Wood competition of 1905. In May 1905 he went through a course of intelligence duties, and was subsequently appointed Intelligence Officer to the 2nd Division at Aldershot. He took part in the Officers’ Bayonet Fighting at the Royal Tournament in London 5 June 1905, and also in the Mounted Infantry Mobilisation 27-29 June the same year. between his heels and throwing his whole weight against his opponent. He was irresistable’. He also received praise from the battalion correspondent: ‘Great credit is due to Lieut Leatham for the energetic way in which he looks after the regimental football’. He was promoted Captain 21 July 1906, leading the B Company team to victory in the Evelyn Wood competition at Aldershot in 1907. A photograph of members of the winning team was published in the GHG for that year. He was appointed Adjutant of the 1st Battalion 16 January 1908, the date the battalion embarked for Egypt. While serving in Egypt, he was a member of the battalion hockey team, played back at polo, and continued to excel at football. Together with other members of the battalion football team he was presented with a gold medal to commemorate the battalion winning the Alexandria Football Challenge Cup in 1908-09. On completion of his appointment as Adjutant in January 1911 he took over command of E Company. He commanded the guard of honour that received the King and Queen at Port Sudan 17 January 1912, and was presented to their majesties. He wrote an article for the GHG recounting a trip he made to Constantinople in August 1910, and followed this with a comprehensive article in June 1911 describing a shooting trip up the Blue Nile undertaken by himself and three other officers in February and March 1911. He next wrote (in the August edition that year) about an expedition on the Nile in 1908. His engagement to Everil Gordon Robinson, younger daughter of Canon H Robinson of Badsworth Rectory, Yorkshire, was published in the GHG for September 1911. The marriage took place at Badsworth Church 27 August 1912, and a lengthy report of this event appeared in the GHG for October 1912. In January 1913 he returned from the 1st Battalion to the Depot for a tour of duty, living at 30 Frenchgate, Richmond, and he was still there when war was declared. 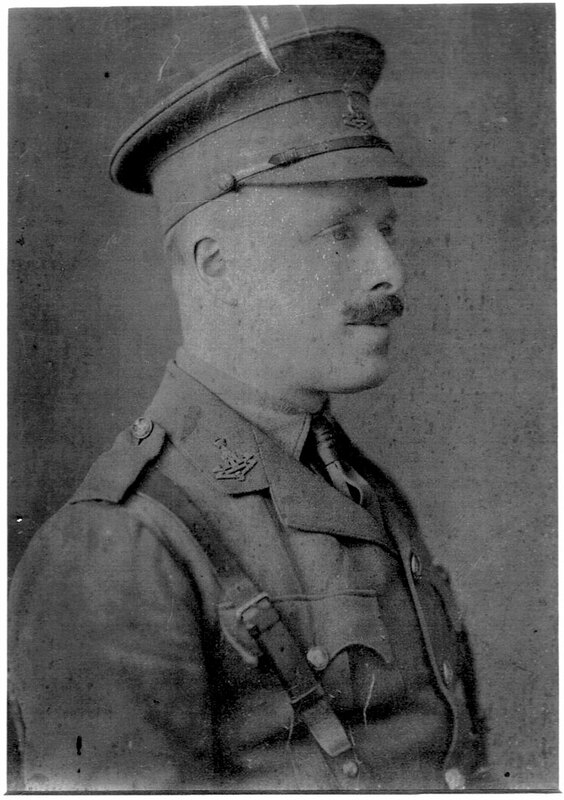 He proceeded to the front to take command of the 2nd Battalion 5 December 1914, relinquishing this role to Lieut-Col Walter Alexander 23 December. He was mentioned in Sir John French’s despatch of 31 May 1915 for gallant and distinguished service in the field, and was created a companion of the Distinguished Service Order 3 June 1915, being invested with the insignia of the order by the king at Windsor Castle 30 July. He was chosen by the commander of IV Corps, General H P Gough, to take over the task of reforming the 2/Wiltshire Regiment; he left the 2/Yorkshires 22 June 1915 with the rank if temporary Major. He was awarded a brevet Majority for distinguished service in the field 4 September 1915, having previously (1 September) been appointed remporary Lieutenant-Colonel. He was killed by a sniper at Hulloch 26 September 1915, shot in the chest at dawn as he took the first opportunity to examine his surroundings as soon as the light was strong enough. He was posthumously mentioned in Sir John French’s despatch of 30 November for gallant and distinguished service in the field. He is buried in Vermelles British Cemetery Plot VI Row D Grave 13. A full obituary and other notices regarding his career appeared in the GHG for November 1915. One referred to him as having been ‘truly described as the best officer that the Green Howards had turned out in the last forty years. He had come rapidly to the front in the past few months and it was no small honour to be selected, while still a Captain, to take command of another unit that needed help’.